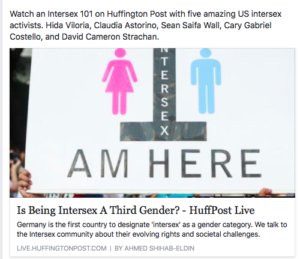 This was perhaps my most enjoyable media experience ever, b/c I got to do it with some of my favorite American intersex activists. I’m grateful & thrilled that HuffPostLive wanted to do a segment with intersex people about who we are, and that they asked me to direct them to the other guests. Joining me are the fabulous Claudia Astorino, Professor Cary Gabriel Costello, David Strachan & Sean Saifa Wall (my co-star in One in 2000 & co-Board President of Advocates for Informed Choice, AIC). Hope you enjoy watching everyone! Note: Unfortunately, this link is no longer available for viewing.